Tony Lopez was watching a movie with his wife when he happened to look through the living room window and noticed that Daryl Crandall was standing in front of the couple's modest home in Homedale, Idaho. That unwelcome sight was just the beginning of the sorrows that ruined what should have been a pleasant and uneventful Saturday night. Crandall, a Deputy Sheriff who is trying to unseat his boss in next week's Owyhee County election, was "standing with his hands on his hips and a disgusted look on his face," Lopez recalled to Pro Libertate. "Then he got into his car, threw it in reverse and was already on his cell phone talking before he pulled away." Lopez and Crandall had a history. A few months earlier, at the behest of a neighbor, Lopez reluctantly attended what had been described as a dinner party but turned out to be a campaign event for Crandall. At the urging of both his neighbor and the candidate, Lopez agreed to support Crandall, and accepted a campaign sign to display in his yard. As he left the event, however, Lopez noticed Perry Grant -- who had been a rival candidate for the Sheriff position -- arriving for the campaign event, attired in his police uniform Lopez considered this partisan political activism by a uniformed, on-duty police officer to be entirely improper, and immediately reconsidered his support for Crandall. Rather than displaying the yard sign, he left it in his shop. Shortly thereafter, as Lopez related to me, he learned of another incident in which on-duty police officers were out canvassing on behalf of Crandall's campaign. This outraged him even further and prompted him to retrieve the candidate's yard sign and display it prominently on his front yard -- with one modification, a black circle with a slash through it, the universal symbol for "no." Does this look like a crime scene to you? The campaign sign Daryl Crandall gave to Tony Lopez as a gift, complete with the supposedly illegal embellishment. "That sign was on my front yard for weeks," Lopez pointed out to Pro Libertate. "We had police pass by our house every day, sometimes several times a day, and nobody noticed it or had a problem with it -- until last Saturday night [October 25], when Crandall came by and called the police." Five minutes after Crandall placed his call, two police cruisers arrived and decanted three officers from the Homedale Police Department. 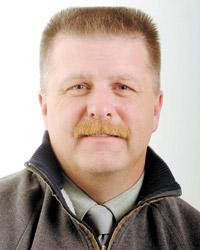 One of the officers was the same Perry Grant mentioned above, a former sheriff candidate who dropped out following last May's Oywhee County primary, in which Crandall defeated incumbent Sheriff Gary Aman. The decision to withdraw was an odd choice on Grant's part, since it left Deputy Crandall without an opponent. Some residents of Owyhee County -- Lopez among them -- believed that Grant had only entered the Sheriff's race in order to draw votes away from Aman, and that once Crandall had defeated his boss Grant's mission was over. Whether or not Grant had acted as Crandall's catspaw in the past, he was acting on the candidate's behalf when he paid that Saturday night visit to the Lopez family. He informed Tony that Crandall had filed a complaint accusing him of "malicious injury to property" -- specifically, defacing a campaign sign that had been paid for by the Crandall for Sheriff Campaign. "I explained to Grant that it was my sign, displayed on my personal property, and that they had no business telling me I couldn't express my political opinions," Lopez related to me. "He told me, `Do you see the writing at the bottom, where it says that it was paid for by the campaign? This sign actually belongs to Crandall, and defacing it is a crime.'" Lopez tried to explain that he had attempted to return the sign to Crandall, only to be told that it was his to keep. That's a point we'll return to anon. In any case, Grant wasn't disposed to hear Lopez's side of the matter. Grant's intransigence prompted Lopez -- a mild-mannered fellow, but apparently not diffident in dealing with bullies -- to remark: "We all know where you're going to work when Daryl's elected." Grant threw up his hands and drove away, leaving two young, rather embarrassed patrol officers the task of giving Lopez a citation that could lead to a $1,000 fine and a year in jail. Crandall signed the complaint as the identified "victim." "These guys were only doing their job," Lopez observed to me in a voice clotted with disgusted resignation. "They obviously didn't think this was a worthwhile use of their time, but they did give me the ticket and take my sign away." Just a few hours later, a friend in the construction business supplied Lopez with the larger, more conspicuous sign seen in the photo above, which he keeps illuminated at night with a floodlight. "If Crandall is elected," Lopez promises, "I'll keep this new sign up until he's gone." Of course, Lopez by all rights should be able to display the modified Crandall campaign sign that drew the ire of the pathologically self-important candidate. Yes, that sign was paid for by the Crandall campaign, but according to Lopez -- in testimony that would be difficult to dispute -- Crandall refused to take it back when offered the opportunity. That means it was conveyed to Lopez as a gift, and thus became the property of the recipient. Q.E.D. 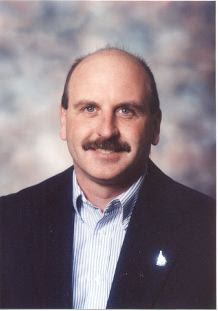 Daryl Crandall, would-be Sheriff of Idaho's Owyhee County. "Crandall and his wife came and knocked on my door a few weeks after I got the [first] sign," Lopez informed me. "He asked me where the sign was, and I told him it was in my shop. He asked me why I hadn't put it out, and I told him." As Lopez recalls the conversation, Crandall said, "Oh, the other side got to you" -- a reference to incumbent Sheriff Aman, who despite being defeated in the Republican primary decided to mount a write-in campaign against his deputy. Aman, who reportedly had already received job offers in other communities, says he was deluged with phone calls from county residents who hadn't voted, expecting him to win easily. Urged to campaign as a write-in candidate, Aman replied that he would do so if his supporters could persuade 1,500 county residents to sign a petition on his behalf. As it happens, Lopez had decided to support Aman, but not because of any inducements offered by the sheriff or his supporters. Crandall apparently suspected otherwise, and -- as reported by Lopez -- attempted to win the voter's support with the vague promise of a government job. "You know, I'm going to be needing help in the county," Crandall allegedly told Lopez, alluding to various positions in the Sheriff's Office. When Lopez pointed out that money was already tight, Crandall reportedly replied, "Oh, there will be money." Nevertheless, Crandall failed to make the sale; Lopez still wasn't interested in voting or campaigning for him. But Crandall didn't see fit to retrieve his campaign sign; rather than reclaiming it, he actually put it up in Lopez's front yard, which is at very least an exceptionally presumptuous act. Any way a reasonable person would see it, Crandall had relinquished his claim on the campaign sign; it was now Lopez's property. So was the front yard in which the would-be sheriff planted the unwanted sign, an act which, under the relevant Idaho state statute, has a better claim to the status of "malicious injury to property" (by way of trespass) than Lopez's unauthorized modification. Correction: In a follow-up conversation today (October 30), Mr. Lopez pointed out it was not Crandall who put up the sign in the Lopez family's front yard. While it is true that Crandall didn't take back the sign when it was offered to him -- "I told him I was lying down on it in my shop when I was changing the oil in my car," Lopez explains -- it was Lopez himself who put it up after modifying it to reflect his opinion of the candidate. Yet it is Lopez, whose property was violated and who claims to endure ongoing harassment by Crandall's supporters, who will be dragged into court on November 5 -- the day after the election -- because his chosen method of expressing a political opinion injured Daryl Crandall's overfed sense of self-regard. "If Aman is re-elected, this whole thing will go away," Lopez predicted to me. "If Crandall wins, I suppose it will go to trial." Lopez, a father of four children (including a teenage son suffering from autism and mild mental retardation), was a stone mason until he broke his back on the job a few years ago. He now works as a paper carrier for the Idaho Press-Tribune, a newspaper published in nearby Nampa. One of the nastiest little repercussions of Lopez's experience was a vituperative and ill-informed article by Press-Tribune associate editor Vicky Holbrook. "I work for that paper, and she didn't even think it was worthwhile to talk to me, to get my side of the story," Lopez protested. Daryl Crandall hasn't had similar difficulty in getting out his version of events, despite his consistent refusal to speak with the press -- about anything. His campaign literature, abounding in promises, is barren of relevant biographical detail. Immediately prior to the May 2008 Owyhee primary, Crandall -- like every other individual campaigning for a county office -- received a survey from the local paper, the redoubtable Owyhee Avalanche. Crandall was one of two candidates who refused to answer the questionaire, which -- in addition to inquiries regarding specific policy matters -- would have required disclosure of biographical details and professional qualifications. Crandall makes a point of describing himself as a military veteran, but few details of his service are publicly available. Since graduating from Glenns Ferry High School in 1981, he has served in a variety of law enforcement and security jobs, both in Idaho and Oregon; he describes himself as a 26-year veteran of law enforcement. What little is known of his record doesn't inspire confidence regarding either his professionalism or judgment. The week prior to the primary, the Avalanche (whose editor, it must be noted, is Joe Aman, the Sheriff's brother) reported that Crandall, who joined the Owyhee Sheriff's Office in 2004, resigned just a few months earlier from his post as police chief in Banks, Oregon, a tiny town near Portland. 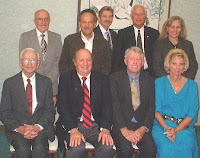 According to an account in the May 20, 2003 issue of the Portland Oregonian, Crandall's resignation the previous week pre-empted his likely firing by the City Council, which was looking into allegations of personal and professional misconduct. The latter involved improper bookeeping and unauthorized use of city property; the former was much more serious -- an allegation that he had choked his teenage daughter during a confrontation in 2003. No charges were filed in the alleged choking incident. Crandall's former mother-in-law, Lorraine Wodyga, claims that she and Crandall's ex-wife have "spent thousands of dollars trying to conceal the daughter's whereabouts from her father," as noted by the Avalanche. This claim makes an interesting companion to one of the few publicly available facts about Crandall's tenure as Chief of Police in Banks, Oregon. In 2001, Crandall helped draft, and testified before the legislature on behalf of, a proposed law (Senate Bill 542) that would have criminalized the act of "assisting a runaway child." This would have been a class "C" felony punishable by a prison term of five years and/or a $100,000 fine. It's entirely possible that Crandall's interest in the issue of runaway children was prompted by purely public-spirited motivations, and untainted by his own domestic concerns. In similar fashion, it's possible that Crandall's zeal to prosecute Lopez for defacing a campaign sign reflects a marrow-deep commitment to the protection of property in principle, and that his indignant body language upon discovering Lopez's supposed infraction was the anguished reaction of a paladin of public order, rather than the theatrical petulance of a petty, self-intoxicated bully. As I said, those are possibilities ... in roughly the same sense that it's possible Paris Hilton could become the leader of a movement to restore teenage chastity. Prior to his five-year tenure as Chief of Police in Banks, Crandall was police supervisor in Glenns Ferry for roughly nine months, from January to October of 1998. He held various law enforcement positions in Idaho's Blaine County, Shoshone County, Canyon County, and the Homedale Police Department before being hired by Sheriff Aman to serve as a deputy in Idaho's second-largest county. At some point, according to one source I spoke with, he also pulled a stint as a security guard at the Ore-Ida plant in Ontario, Oregon. The patchiness and a pungency of Crandall's record are hardly improved by his determined evasiveness about its details. He's a very suitable illustration of the need for the much-maligned "Rate My Cop" system, which provides a customer satisfaction rating for law enforcement personnel. His resume is likewise suggestive of the ease with which "problem" law enforcement officers can migrate from one town to another and find employment without enduring anything approaching adequate scrutiny. Building a surveillance state abroad, when the real struggle for freedom is here at home: Sgt. 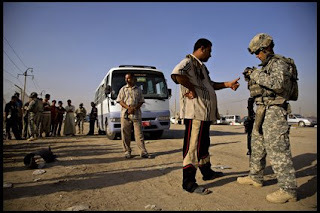 Anthony DeAugustineo, a 25-year-old native of Homedale, Idaho, uses a portable scanner to check an Iraqi's fingerprints against a database of terrorism suspects before allowing the man to ride the bus. Don't be surprised to see the same technology employed, ere long, in airports, train stations, and elsewhere here in Der Heimat. Shortly after he was given a summons to appear in court for the supposed crime of altering his own property to express his political views, Tony Lopez had a telephone conversation with his 25-year-old son Jay, who is currently stationed in Germany following combat tours in Iraq and Afghanistan. "When I told him about what happened to me," Tony recalled, his voice thick with emotion, "Jay said, `Dad, what the hell am I fighting for over here?... Don't let them bully you, don't let them intimidate you. I sure wish I were there with you." Although Tony Lopez would probably disagree with my assessment, I believe his experience, and the potential conflict he could have with a Sheriff prone to abuse his authority, illustrate another reason why the wars in Iraq and Afghanistan should be ended immediately. As the government ruling us, from the imperial heights in Washington to the smallest retail outlets of tyranny found in rural America, becomes overtly hostile toward what remains of our liberty, the fittest and most idealistic of our youth should be engaged in the real freedom struggle here at home, in whatever fashion that battle may need to be fought. Writing in response to the Idaho Press-Tribune editorial mentioned above, former Owyhee County prosecutor Ed Yarbrough takes to task Managing Editor Vickie Holbrook (incorrectly identified earlier as "associate editor") for "the false conclusion that Tony Lopez is guilty of a crime." "The crime of Malicious Injury ... [requires] evidence of a specific type of criminal intent known as malice," Yarbrough observes. "Anyone can see that Mr. Lopez only intended to make a political statement. This is evidenced by the fact that he put a political sign in his front yard in broad daylight.... Criminals do not display their criminal deeds in their front yard for the world to see." Given the absence of criminal malice involved in this matter -- unless, as Daryl Crandall's needy ego would dictate, we assume that public opposition to his candidacy is intrinsically malicious -- it "cannot even be considered a dispute," continues Yarbrough. 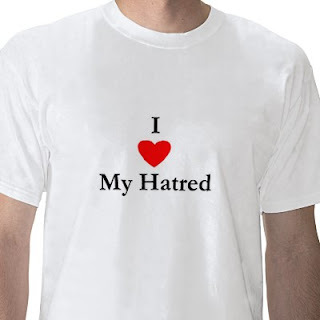 "It is best characterized as a property misunderstanding. This fact makes the presence of criminal intent even less likely. It is easy to see that Mr. Lopez may have thought that the sign was his. It was left at his property un-displayed and effectively abandoned for many weeks. Mr. Crandall showed no concern for the sign until Mr. Lopez expressed his political speech with it." "The truth is Mr. Lopez never acted like a criminal or with any criminal intent," concludes Yarbrough. "He was being a good citizen by expressing his political views. When a nerve was struck, Mr. Lopez was charged with a serious crime over a simple misunderstanding involving a sign of nominal value." In this matter, is the prissy thuggishness of Daryl Crandall that is best characterized as a crime: Unable to countenance public criticism without getting his frilly underthings in a twist, he maliciously arranged for the spurious prosecution of an innocent and well-respected citizen, who certainly has better things to worry about than the time and expense that will be required to deal with Crandall's fraudulent charge in court. Because Gary Aman's re-election will require voters to write in his name, and spell it correctly (a mis-spelling would void a ballot), there is a chance that Daryl Crandall could be elected sheriff next Tuesday, making him the paramount law enforcement officer in Idaho's second-largest county (in geographic terms). This can't be permitted to happen -- not only because of the unprovoked crime Crandall committed against Tony Lopez, but also because the candidate's history demonstrates that he has no business whatsoever holding an office of public trust, particularly one involving the discretionary use of lethal violence. Watch this space for additional details, coming soon. Pwned by the "Ownership Society"
Public Enemy on the loose! 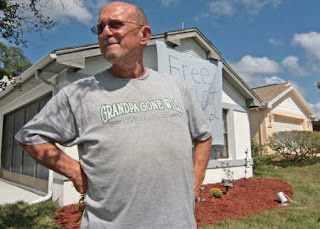 After spending a weekend in jail -- without bail -- for the supposed crime of having a brown lawn, 66-year-old Joseph Prudente defiantly models the "Grandpa Gone Wild" novelty t-shirt his grandchildren bought in his honor. Politically favored Wall Street swindlers guilty of deliberate fraud that destroyed imponderable amounts of wealth luxuriate in additional trillions extracted, through government-sanctioned theft, from the law-abiding; meanwhile, honest people who earnestly do their best to meet their financial obligations despite being battered by successive waves of misfortune find themselves threatened with the loss of everything they cherish, beginning with their individual freedom. 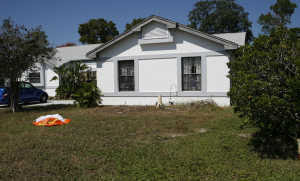 When Joseph Prudente's adult step-daughter, husband, and two children found themselves without a home, he did what any decent parent would do: He took them into his home, a single-story four-bedroom home in Bayonet Point, Florida (a town not far from Tampa). Prudente is a 66-year-old retired RN; he and his wife live off his pension and their respective Social Security checks. With their family suddenly expanded by four people, including two young children, the Prudentes' household budget quickly proved to be inadequate. Joseph and his family found themselves overmatched by their circumstances. One result was the repossession of Joseph's car. They also found themselves behind on their newly augmented mortgage payments, which had increased by $600 a month. When the sprinkler system that irrigated their yard broke down, the Prudentes most likely ignored this development, thinking it was the least of their problems. Thanks to the Beacon Woods Civic Association (BWCA), the busted sprinkler system proved to be the most acute of the many problems afflicting Joseph Prudente and his family. The BWCA oversees the 2,600-home development, which operates under a restrictive covenant. One term of that agreement dictates that no homeowner will permit more than a tenth of his yard to become unsightly. How Green Was My Fairway: The Beacon Woods golf course appears to be in violatation of the community's "10 percent" rule regarding brown grass. As Prudente's lawn began to wither, the BWCA -- whose leadership is composed of the sort of people who would have struck the ancient Pharisees as excessively full of themselves -- sent Prudente several letters demanding that he re-sod the yard, at considerable expense. Prudente, who would have been forgiven for telling the local Bluenose Bund to sod off, patiently explained that the expense of re-sodding the lawn was beyond his means at the moment. He could afford to perform cosmetic surgery on the yard, or try to catch up on his mortgage; he couldn't do both. Joseph decided -- as any rational person would -- that it was more important to keep his house than to appease the BWCA. The Homeowners' group did what people of that ilk always do, when given the opportunity: They petitioned the State to punish someone whose problems could have been easily resolved through peaceful, private action. The BWCA filed a lawsuit against Joseph, who simply didn't have the ability to comply with the organization's demands. "I explained the situation to them, but they said the rules are the rules," Prudente told the New York Post. "They showed me a rulebook that was thicker than the book War and Peace. They said, 'You signed an agreement to follow the rules - and the rules are the rules.' "
Let it be acknowledged that the BWCA acted within the terms of its agreement with Joseph, in exactly the same sense that Shylock acted within the terms of his contract with Antonio when the moneylender demanded that the Merchant of Venice be put to death for defaulting on his loan. Shylock, of course, knew the lethal consequences of extracing a "pound of flesh," and he acted with malicious opportunism when Antonio -- through no fault of his own -- was unable to pay the debt on the appointed date. The BWCA likewise revealed itself to be utterly lacking in a certain quality of mercy as it pursued its case against Prudente, which resulted in a court order sending the embattled grandfather to jail, without bail – for the supposed crime of having a brown lawn. 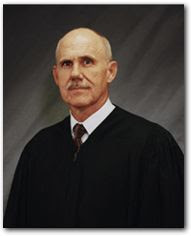 Never expect common sense from someone whose first name is an initial: Florida Circuit Court Judge W. Lowell Bray, who sent a grandpa to jail without bail for having a brown lawn. News of Prudente's sentence produced an entirely commendable wave of public revulsion, which was directed in roughly equal parts at the BWCA and its robe-wearing ally on the bench. The furor prompted two members of the board to write letters to the local newspaper attesting to their own compassion, wisdom, and insight. The reaction of less self-enraptured people in the neighborhood was much more productive: Led by a former Marine named Andy Law, the neighborhood spontaneously rallied behind Joseph and his family. A crew of about twenty people pitched in to donate money and time to re-sod the lawn on their behalf. "What are we coming to," a properly disgusted Law commented to the local media, "when we're putting our senior citizens in jail for having a brown lawn?" "Everyone's having a hard time now," Law pointed out, alluding to the fact that the effects of the unfolding Depression can be felt in his neighborhood, where foreclosures and short sales are becoming common. "There's a lot worse things going on than brown lawns." Indeed: One of those "worse things" is the species of Communitarian nosiness practiced by the BWCA and other quasi-governmental bodies of its kind, which are invariably populated by people much more comfortable with coercion than cooperation. "We're not a pack of Nazis," snivelled BWCA President Bob Ryan. "We're simply fellow homeowners of Mr. Prudente, I felt sorry for him." Apparently, Ryan's supposed sympathy didn't prompt him to ask if he could help the poor, overburdened grandfather, rather than suborning state-administered violence against him -- a "solution" that actually solved nothing. Unfortunately, the times we inhabit are congenial to the cultivation of a Shylockian spirit, and the homeowners' association that afflicted Joseph Prudente is not the only one to play host to that demonic influence. A very similar spectacle played out in Kennewick, Washington, a town separated by a continent from Tampa, Florida. Last year, Burke Jensen and his family bought a very nice starter home on a 2.5-acre lot. The property is devoid of landscaping, and the restrictive covenant of the Oak Hill Country Estates Homeowners' Association requires that new homeowners complete the necessary improvements within a year of taking occupancy. Several months ago, Jensen hired a landscaper -- at a cost of several thousand dollars -- to seed, irrigate, and otherwise develop the lawn. Unfortunately, neither Jensen, nor his wife, was able to supervise the work in person: Five months ago, Jensen, a Lieutenant in an Army Reserve military police unit, was called up for active duty in Kuwait, and his wife -- who just gave birth to the couple's second child -- decided to return to the East Coast to live with family during her husband's absence. This extraordinary conjunction of unfortunate events brought out something substantially less than the best in Chick Edwards, the owner and developer of the subdivision and sole member of the local HOA. "I really don't give a [sibilant expletive] where he is or what his problem is," Edwards informed the Seattle Times. "It really doesn't matter to me. [He] doesn't have the right to walk away from his obligation.... This is a contract. I don't like the way his property looks. This clown gets to do what he wants, and I'm mad as hell." Edwards, eager to get his Shylock freak on, threatened to sue Jensen, who currently resides in a location not terribly accessible to process servers. While Edwards simmered in his own bilious essence, Jensen's neighbors mobilized on his behalf -- and, once again, they didn't need the services of a government bureaucrat or a foundation-funded soi-disant "community organizer" to do so. Scores of people contributed time and money to finish the half-completed irrigation system and get the landscaping work finished. Owners of at least a dozen local businesses provided landscaping materials, work crews, and even catered meals. The work was completed in a week. Mr. Edwards have been heroically conciliatory. If only resolutely decent people of the sort who came to the aid of the Jensen family could have been mobilized to prevent the unnecessary war that has wrecked our economy.... Thanks to the Depression brought on by the criminal overclass, opportunities to render and receive help of this kind will be tragically abundant. Peaceful, cooperative action of this sort -- free individuals voluntarily pooling their means and abilities to prevent or reverse an injustice -- will become increasingly important as Statists in every social station seek to exploit our unfolding economic catastrophe for their own benefit. Using peaceful approaches to deprive the predatory state of its intended victims can be as satisfying to us as it is infuriating to our enemies. the electorate is about to get fooled again. It's entirely appropriate that Hugo Chavez, the repellent yet consistently quotable Marxist ruler of Venezuela, has gloatingly observed that "Comrade Bush ... is to the left of me now." Republicans seeking to stave off their richly deserved electoral massacre have rummaged through their shelves in search of a credible re-election theme, only to find that the cupboard is bare, the pantry is empty, the garden has been razed, and nobody at the local grocery store is willing to take their check. So they have surrendered unconditionally to what has always been the unifying element of the Bush-bot Coalition: Pure, unalloyed, tribal hatred of the Other Side, whether defined as "terrists" (that's Bushian for "terrorists"), "leftists," "liberals," "cultural progressives," or merely "People with library cards who speak in complete sentences and don't merely recite the latest thought-stopping slogan retailed on the Sean Hannity program." Conservatism, which was once flavored with an almost imperceptible touch of principle, has long since ceased to be anything other than a cynical movement devoted entirely to obtaining and retaining political power. 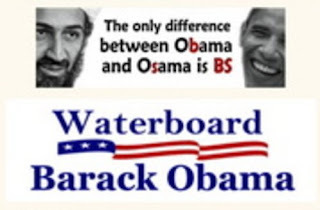 This is all they have left: Appealing to the basest instincts of its base, the California branch of the Grand Old Torture Party now admits that "waterboarding" is torture, only to embrace the idea that it is suitable treatment for its political rivals. Once the Bush-centered conservative movement is deprived of power, it will undergo a process I'm tempted to call reductio ad odium -- that is, it will be reduced to nothing more than a shared hatred of the Obama-centered liberal faction. The post-Bush conservative movement's lead demagogue will be the public figure best able to make a thick, unpalatable reduction sauce from all the charred bits of resentment and residual ambition that cling to the political frying pan. I suspect that it will be ideologically brown in color and have a flavor similar to that of other bloody-minded nationalist movements whose deeds made 20th Century history so stimulating. In the meantime, Mr. Obama -- who is hardly diffident in embracing what he takes to be his destiny to "change the world" -- will inherit the world's largest, most expensive, and most powerful executive apparatus. From those who built that apparatus or supported the project we can now hear angry, anguished warnings about the dangers of entrusting it to the likes of Obama. Many of those people, carried away in flights of adolescent hubris, apparently believed that the Republicans would rule in perpetuity. Others, who must be the kind of people surprised by the advent of winter each year, simply didn't foresee the possibility that the GOP would fall out of political favor. Stay classy, GOP: This charming little illustration was circulated among California Republicans -- the "mainstream" variety, not UROC -- most of whom see nothing amiss with keeping military contractors and other corporate welfare whores on the federal dole. It's possible that at least some who had been captured by the Bushcult will rediscover the virtues of the separation of powers, checks and balances, and the other key concepts and practices of federalism that we were ordered to discard in the name of national unity in the "war on terror." This is a possibility in roughly the same sense that it's possible 50 Cent could secretly be an authority on Elizabethan poetry. The Wall Street Journal spent the last eight years hymning the glories of unrestricted executive rule and heaping anathemas on those who opposed perpetual war and the destruction of the Anglo-Saxon concept of due process. Its editorial board recently gave tremulous voice to concerns over the uses to which an Obama Regime would put the powers now concentrated in the presidency. The elevation -- or is the proper term "condescension," given his quasi-divine status? -- of Obama to the presidency "would be one of the most profound political and ideological shifts in U.S. history," insisted the Journal's editorial collective in words that practically shivered with anxiety. This "period of unchecked left-wing ascendancy" would "mark the restoration of the activist government that fell out of public favor in the 1970s." No responsible adult possessing a scintilla of political knowledge and so much as a particle of honesty could write those words and expect them to be taken seriously. The Journal seems to mock its own argument by complaining that the Obama-led liberals would actually reduce federal power in some ways. For instance, they may demand "the watering down of No Child Left Behind testing standards," or "the end of Guantanamo and military commissions"; the former would scale back unconstitutional Bush-era centralization of education, the latter would end a civil liberties abomination that threatens the liberties of everybody. The rest of the Journal's editorial offered several variations on a familiar theme, namely that under the reign of the "Liberal Supermajority" the State would confer its burgled bounty on a different set of beneficiaries, and wield its enforcement powers on behalf of a different set of prejudices. All of this is inspired by the equation that defines all modern politics -- Lenin's axiom that the central political question is "Who does what to whom." Both branches of the Dominant Party are thoroughly Leninist, in that they appear to recognize no limit on the power of the State (Lenin defined his governing model as "power without limit, resting directly on force") and seek to be the "Who" rather than the "Whom" in the ruling equation. We are weeks away from the election, months from the actual vote in the Electoral College, and the Inauguration is on the other side of New Years' Day. Nonetheless, Obama's handlers -- from Joe Biden to Madeleine Albright to Colin Powell -- are so anxious to institutionalize a new Leader Cult that they're skipping all of these intermediate steps. 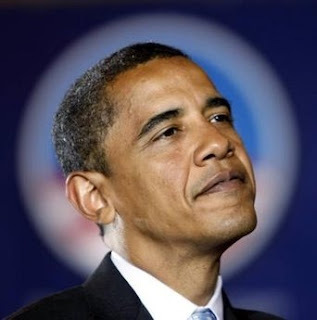 Predicting an unspecified "challenge" to the Holy One during the first six months of his reign, Biden -- speaking to an audience of donors during a stop in Seattle -- seemed to be pleading that Obama's adherents display a religious devotion to his administration, irrespective of the decisions they make and the reaction they get from the untutored public. "Gird up your loins," admonished Biden. "I'm asking you now, be prepared to stick with us. Remember the faith you had at this point because you're going to have to reinforce us." It's not clear whether the "generated crisis" Biden predicted with utter certainty would take the form of a military confrontation abroad, a new and devastating permutation of our ongoing political collapse, or perhaps the need to deal forcefully with internal opposition to the glorious new order. 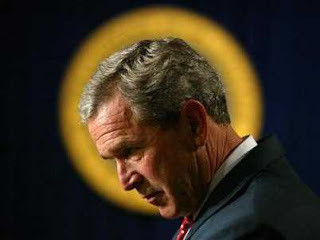 What is clear, however, is that even as Bush-era True Believers will trade places with the Outcasts, the Cult of the Presidency will enjoy a growth spurt -- and everyone will be ordered to set aside their reservations about the New Redeemer's decisions in the name of national unity. I eagerly hope that, when that confected crisis comes, the embittered Republicans tell the Democrats to inseminate themselves. I hope that this, in turn, leads Democrats to escalate their demands for Republican submission. Among my fondest hopes is that eventually this political conflict becomes an irreconcilable split between the "Red" and "Blue" Americas, and that this rupture would provide opportunities for regional secession by those of us who want nothing more to do with the Empire, its wars, its corruption, and its collapsing economy. There is a certain diabolical genius behind the division of the United States into "Red" and "Blue" factions. Each of the constituencies cattle-penned into one of those categories covets the power of the central government to compel the other to do its bidding. After dilating at length on the resentments that define contemporary Conservatism, I'm obliged to point out that Liberalism is just as laden with animus toward those who don't share that creed. "You see the state where James Byrd was lynch-dragged behind a pickup truck until his body came apart -- it's red. You see the state where Matthew Shepard was crucified on a split-rail fence for the crime of being gay -- it's red. You see the state where right-wing extremists blew up a federal office building and murdered scores of federal employees -- it's red. The state where an Army private who was bludgeoned to death with a baseball bat, and the state where neo-Nazi skinheads murdered two African-Americans because of their skin color, and the state where Bob Jones University spews its anti-Catholic bigotry; they're all red too." Columnist William O'Rourke of the Chicago Sun-Times amplified this theme, designating the states who had rejected Al Gore as "Yahoo Nation." O'Rourke described "Yahoo Nation" as "a large, lopsided horseshoe, a twisted W, made up of primarily the Deep South and the vast, lowly populated upper-far-west states that are filled with vestiges of gun-loving, Ku Klux Klan-sponsoring, formerly lynching-happy, survivalist-minded, hate crime-perpetrating, non-blue-blooded, rugged individualists." "Yahoo Nation," he continued, boasts not so much as "one center of thinking America, the teeming centers of creative and intellectual life." Gore's Blue State constituency, by way of contrast, included what O'Rourke was pleased to call "America's great cities: New York, Boston, Washington, D.C., Chicago, Los Angeles, San Francisco, Philadelphia, Seattle." What neither Begala nor O'Rourke, nor anyone else of their ilk, has ever explained is this: If "Red State" Americans are such irredeemable degenerates, why are they permitted to participate in the political process at all? One possible answer is that the current system is built around a cynical symbiosis between "Red" and "Blue": They are indispensable foils for each other, each anxious to be the "Who" rather than the "Whom." By mobilizing resentments through appeals to various hot-button issues that never grow cold through resolution, the Power Elite that created this artificial division herds people into the voting booth to perform a liturgy that has no demonstrable impact on public policy, but ensures the continued "legitimacy" of the Regime. In this way, all of us -- Red, Blue, or of neither of those synthetic political shades -- are rendered part of the "Whom," the undifferentiated "people" on the receiving end of whatever the ruling "persons" see fit to inflict on us. But this arrangement may, at long last, be breaking down, just as the delusion-based fiat money financial system has entered its terminal phase. As we descend into what will be a long and bitter depression, it's possible that, not all that far in the future, the "Red" and "Blue" Americas might decide that they really don't want to be part of the same polity. Try as I might, I can't see why this would be a bad thing. Our current configuration is not a reflection of some divinely ordained design, after all. There's no reason why several "Americas" wouldn't be able to share the same continent, engaging in peaceful commerce and otherwise minding their own business. And it's difficult to see how such an arrangement would be "un-American"; those who truly love America would want the world to be blessed with not one, but many of them. Given the unfortunate outcome last time a group of American states decided to quit the "Union" club, it's clear that the dangers of political fission are great. But remaining artificially yoked together in a bankrupt, increasingly untenable Union would most likely be fatal to liberty. Painful as it would be for the USA to disintegrate, this may well be the only way that we can avoid descending irretrievably into undisguised tyranny -- and Obama might just be the figure to precipitate such a breakup. And given the fact that Washington is entirely broke and likely to run out of credit, there's even a chance -- a tiny one, mind you -- that this breakup could happen without Red and Blue replicating the mass bloodshed that accompanied the attempted divorce between Blue and Gray. Without the financial means to carry out an actual civil war, Red and Blue might simply have to say to each other, "Fare thee well -- and get ye lost." It probably won't happen that way. But keep a good thought, anyhow. Just in case you're interested, the grammatically dubious title of this essay was inspired by this. Tie him to the Whipping Post: Mendocino County Sheriff Tom Allman apparently sees nothing amiss in sending his thugs to steal the life savings of a seriously ill, law-abiding elderly couple. As the economy collapses, credit lines become constricted, and tax revenues are choked off, we can expect local representatives of the parasite class (commonly called "government") to become perversely creative in finding new ways to extract money from productive people. 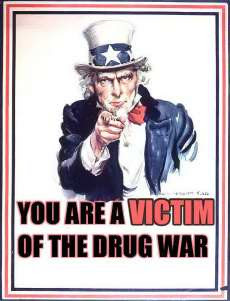 For parasites looking to feast on the wealth of others, the liberty-devouring fraud called the War on Drugs offers a particularly rich menu of possibilities. As we've discussed before, Police and Sheriff's departments in many jurisdictions are robbing people blind in the name of civil asset forfeiture, an officially sanctioned form of robbery in which cash or property is deemed "guilty" of involvement in narcotics trafficking. It's not necessary to prove that a crime has been committed, or even to arrest or charge an individual with a criminal offense. All that is required is for an officer to assert some "nexus" between the coveted money or property, and then a civil procedure begins in which the onus is placed on the victim to prove that both he and his property are innocent. Law enforcement bodies across the nation are engorging themselves on the corrupt proceeds of such plunder. Tom Allman, Sheriff of California's Mendocino County, recently advanced this depraved science by devising a way to seize both property and the money belonging to people who have explicit government permission to cultivate and use marijuana for medical purposes. Allman, it must first be understood, insists that even though "a marijuana plant that's legal looks just like a marijuana plant that's illegal," his Sheriff's Department carefully discriminates between the legal cultivation of medical marijuana, and that grown for illicit "commercial" use. He also claims that "I have friends who benefit from medical marijuana." Allman also takes offense when his department is accused of exceeding its mandate by seizing medical marijuana. "The Sheriff's Office focuses its eradication efforts on commercial marijuana operations," Allman insisted in an essay-length letter published in the October 10 Ukiah Daily Journal. "We do not target legitimate medical marijuana patients or their caregivers." 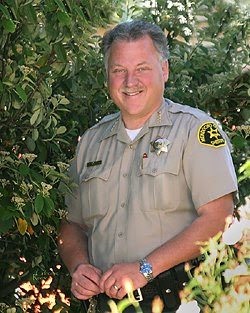 In fact, Sheriff Allman continued, his department actually protected legitimate medical marijuana crops from violent criminals who would poach them and sell them illegally: "Recently our office arrested eight Sacramento area young people who drove to Mendocino County for the sole purpose of stealing marijuana. All eight were arrested within an hour of the crime. Investigation into a series of violent marijuana robberies on the Coast has resulted in the arrest of more out-of-county criminals." "The citizens of Mendocino County can be proud of the work our detectives put into these cases," concluded Allman in the kind of self-congratulatory plug that's de rigueur in official communiques from the governing class. To be fair, the September 19 marijuana robbery was a serious property crime, in which six large plants -- each of which was valued at $3,000 -- were stolen at gun point from 57-year-old Laytonville resident Richard Weaver, who cultivated them for medical use. This was an example of that rarest and most unexpected of things, a government agency actually acting in defense of an individual's person and property. However, Allman's heroic deputies didn't bestir themselves to solve an even more egregious armed robbery involving medical marijuana that took place in Philo the following Wednesday. That crime involved the seizure of 17 marijuana plants and over $80,000 in cash. As was the case with the Laytonville heist, the victims of the second crime had legally cultivated their plants for their personal medical needs. Where Mr. Weaver was a sick man on the wrong side of 50 confronted by eight armed, college-age men, the victims in Philo were Lester and Mary Smith, both of whom are in their ninth decade and suffer from a variety of afflictions, from severe arthritis to heart disease. Mary is confined to a wheelchair, and Lester, a World War II veteran, is immobilized by two bad hips and suffers from frequent chest pains that make it nearly impossible to breathe. The pitiless thugs who attacked the Smiths on September 24 not only took away their indispensable pain medication -- for which they had obtained the appropriate prescription, and the necessary growing permit -- but stole their life savings as well. It's difficult to conceive of a personality so utterly surrendered to criminal appetites that it would commit such an act. Since Sheriff Allman is so eager to throw laurels at the feet of his intrepid detectives, one might expect him to deploy them in pursuit of the fiends who assaulted Lester and Mary Smith. "Let every brush be beaten; let every stone be capsized; let no clue elude your vigilant gaze," one imagines Sheriff Allman commanding his eager detectives, assuming that he favors the over-ripe diction typical of a hero from a 19th Century Penny Dreadful serial. "Darken not the door of this Sheriff's Office again until you hold, within the unyielding grasp of incarnate Justice, those responsible for reducing this venerable couple to their present undeserved state of penury!" One would expect Sheriff Allman to issue a command of that sort to his detectives, albeit in less florid language. One would be wrong. You see, the perpetrators who robbed the Smiths at gunpoint were Allman's deputies, so having the detectives build a case about them would pose some interesting problems in workplace etiquette. "Four of these guys [the deputies] came in here, big as barnyard bulls, hollering real loud, accusing us of growing marijuana to sell," Lester Smith told Pro Libertate in a telephone interview. "They do everything they can to scare you and get you frustrated." Smith lives near three grandchildren who rent properties from him. One of them is his 31-year-old granddaughter Yolanda, who was the victim of a lengthy, abusive harangue by one of the heroic deputies. "The trailer is nearby, and I could hear him yelling at her," Lester recounts. "He kept screaming at her, `Your grandpa gives you pot to sell for money!' and she kept telling him that I don't. This went on for a long time, and he eventually made her cry and even throw up. She told me that she was convinced that if she just told him what he wanted to hear, he'd leave her alone, so she eventually said `yes.' But I never did anything of the kind; we have a prescription, my daughter got the permit, and we grow marijuana here only to use as medicine." The only "legal" justification for seizing anything from the Smiths would necessarily involve some kind of criminal charges. Yet neither Smith nor his wife, nor any of their children or in-laws, has been charged with a crime. So even by the terms of what Sheriff Allman calls the "law," this incident is nothing more than felonious armed robbery, carried out under the color of supposed authority. Not long ago, Mary Smith received a $52,000 inheritance. And roughly a year ago Lester started to withdraw money from his bank accounts in anticipation of the economic catastrophe now in full flower. When Congress passed the Plutocrat Bailout and Economic Dictatorship Act two weeks ago, Lester cashed in his CDs. When the Sheriff's deputies arrived to conduct their little robbery, the Smiths had $81,000 in the family safe, and then tore up another $51,000 in medicinal marijuana plants. Casing out fresh victims? Officers from the Mendocino County Sheriff's Department prowl the rural highways of beautiful northern California. This is a total haul of $132,000, which is pretty impressive for just a couple hours' worth of government "work." Lester and Mary have to wait until next March 3 to begin the long, painful, and expensive process of trying to recover the money Allman's department stole from them. Interestingly, Allman and his homiez at the DA's office didn't attach the Smith's minuscule checking account, which they could have done had they really believed that the elderly couple were "drug peddlers." But with their savings now being used to keep the Sheriff's Department supplied with donuts, Lester and Mary now have nothing but their Social Security checks and the $600 he gets from renting properties to his three grandchildren. The Smiths are a couple who had saved nearly everything they earned that wasn't spent on necessities. They are children of the Great Depression, who were making preparations to deal with the Greater Depression (Lester indicated to me that he was planning on buying gold). Stricken with years and left helpless by disease, they were an easy target for a predatory law "enforcement" agency. This kind of thing is going to become very commonplace. Sheriff Allman, you'll recall, admits that he can't tell the difference between a "legal" marijuana plant and an "illegal" one. Clear-headed people will have exactly the same problem in trying to find a moral distinction separating the gang of private sector thugs who robbed Richard Weaver, and the government-authorized gang that terrorized and robbed Lester and Mary Smith. The gang that attacked Weaver behaved very much like a police unit: They gathered intelligence about Mendocino County's legal marijuana gardens, coordinated their movements via radio, and carried firearms to compel their victims to submit. As far as I can tell, the only substantive differences between these two robberies were, first, that the crooks who robbed Weaver had a much smaller take, and second, their heist was unsuccessful, because it was foiled by the intervention of a much larger, better equipped, and more ruthless gang. Sheriff Bubba's new toy: Georgia's Cobb County Police Department recently paid $45,000 -- anybody wanna bet that the funds came from an asset forfeiture fund? -- to refurbish this $500,000 "Peacekeeper" light armor vehicle, which was donated -- anybody wanna bet through the Pentagon's LESO program? -- to the department. "Everyone knows that the State claims and exercises [a] monopoly of crime ... and that it makes this monopoly as strict as it can. It forbids private murder, but itself organizes murder on a colossal scale. It punishes private theft, but itself lays unscrupulous hands on anything it wants, whether the property of citizen or of alien.... Of all the crimes that are committed for gain or revenge, there is not one that we have not seen it commit – murder, mayhem, arson, robbery, fraud, criminal collusion and connivance." In ways too numerous to chronicle (I'm doing my best, and falling behind badly), the local police in our country are rapidly becoming the most serious criminal threat we face. This is because common crooks, when repelled, will retreat and seek other victims, but criminals in State-issued costumes will summon sufficient force to visit exemplary violence upon those who resist. This is not an argument against righteous resistance, but rather a sober tactical assessment of the enforcement arm of an Enemy that has dropped any pretense of acting on behalf of the public good. Recently, in reply to a very kind inquiry about Korrin's health and our family's circumstances, I described at length some of the challenges we have recently experienced. In response I've received an enormous outpouring of kindness from many of you who take the time to read what I publish in this space. I earnestly wish there were words adequate to convey my gratitude for your concern, your prayers, and also the many acts of generosity that have been made toward me and our family. Thank you, all of you, very much. More timely than ever, and it's available now.